Last year DC unveiled a new set of their 'Designer Series' toys based on the stunning artwork of Jae Lee - and now we've got an even better look at the final figures, as well as a release date. It's not changed since they were revealed, but what I love the most about figures that they aren't just 'realistic' translations of Lee's designs into action figure form, but directly attempt to emulate his style - the paler colour palette, the detail lines all over the suits to create wrinkling and areas of shading, they look fantastic. 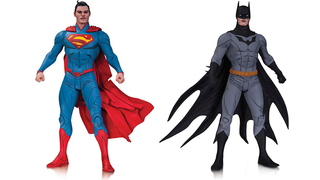 I particularly like the stylistic shaping of Batman and Superman's capes - Supes especially. It really makes these figures striking display pieces, and look like they're ripped straight from Lee's art. Each figure will set you back $25 when they come out in August. Be still, my beating wallet.